Cubic zirconia (CZ) is the cubic crystalline form of zirconium dioxide (ZrO2). The synthesized material is hard, optically flawless and usually colorless, but may be made in a variety of different colors. Its refractive index is high at 2.15-2.18 (compared to 2.42 for diamonds) and its luster is adamantine. From the selection of materials to every detail in production, to the final product, each jewelry has been carefully designed and strictly controlled. Expecting that SISGEM jewelry make your heart sing every time you wear them and that speak to your core. 1.Separated it from hard items to prevent scratches and store it in a fabric-lined jewelry box or pouch. 2.Do not expose to harsh chemicals such as cosmetics, hairsprays, perfumes, chlorinated water. 3.To clean gold plated jewelry, use warm water, a mild soap, and a soft bristled brush, if needed. 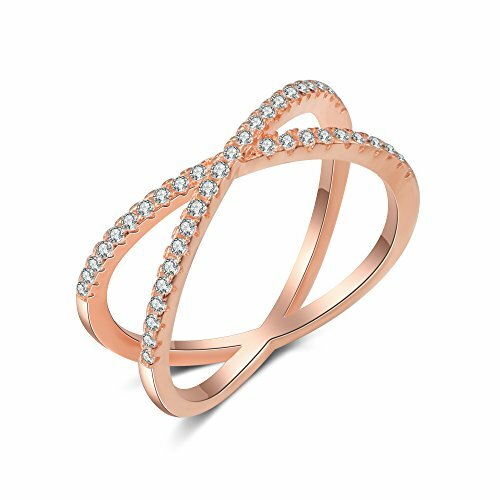 【Material】Crafted of 925 sterling silver with 18ct gold plated, cubic zirconia (simulated diamond ), this CZ ring for women is nickel-free and hypoallergenic, suitable for sensitive skins. 【Design】 classic X shaped ring decorate with shining cubic zirconia, this simulated diamond X ring would make you look elegant and feminine. 【Measurement】 Artificial opal: 0.78" * 0.79" ( 20.2mm * 19.9mm ); Total weight: 1.89 g. the charm sterling silver cubic zirconia rings rose gold fit well with any outfit, from jeans to dress, from office wear to evening prom. 【Gift for Her】 The cubic zirconia criss cross ring packaged in a gift box is a great gifts idea for Engagement, Wedding Party, Graduation, Birthday, Valentine's Day, Anniversary, Mother's Day, Christmas, Thanksgiving and etc. If you have any questions about this product by SISGEM, contact us by completing and submitting the form below. If you are looking for a specif part number, please include it with your message.